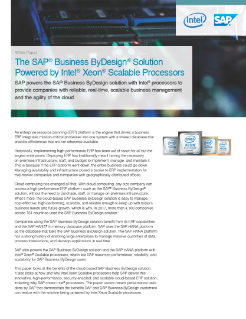 Cloud-based ERP powered by Intel® processors using SAP Business ByDesign* provides mid-market enterprises with reliable, real-time, scalable business management and the agility of the cloud. See how Intel & SAP are partnering to deliver hardware & software solutions that provide enterprise infrastructure platforms. Improve predictive analytics by running SAP HANA* machine learning on hardware powered by Intel® Xeon® processors. Boost Business Performance with SAP HANA* Machine Learning and Intel® processors.